Most people recognize it as an often eaten canned food, but the tuna is indeed a fish, a saltwater one to be precise. Similar to the mackerel, tuna has the distinct ability to maintain its body temperature higher than the existing temperature of the water. 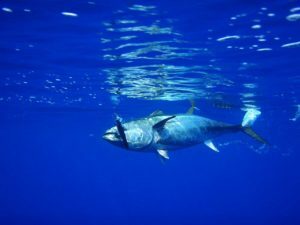 Often seen swimming in warm water, the tuna continues to maintain a strong demand in regards to its appeal among commercial fishing and it also maintains popularity as a game fish. Over seven different species of tuna can be found throughout the oceans of the world, and their lifestyle remains nomadic, living as long as thirty years in certain cases. Measuring over six feet and weighing more than 500 pounds, the tuna requires talent and skill to catch. If the numbers when it comes to its size seem surprisingly large, consider that the largest tuna ever caught had a length of over twenty feet long and weighed a massive 1,600 pounds! Tuna are agile predators, and their colors are ideal for camouflage. Even with their humongous size, they are able to navigate the oceans at more than sixty miles per hour. In addition to its speed, the tuna can adjust the position of its pectoral and dorsal fin to aid in acceleration and reduce the amount of drag, which the tuna uses to assist with nabbing its prey. Herring, mackerel, squid, and crustaceans are a couple of examples of the sea dwellers the tuna likes to eat.